We spent the evening back in Ontario, CA at the Doubletree Hotel for the Thompson Boxing Promotions show, Path to Glory. 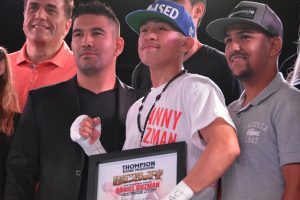 The main event featured Isaac Zarate (13-3-3, 2 KOs) going up against Christian Esquivel (29-12-1, 22 KOs) in a bout that was scheduled for eight rounds in the featherweight division. The opening round was an uneventful one. The two fighters were taking pot shots at each other, but not doing any real damage early on. All that changed in the second, as they turned up the heat, especially Zarate. He was throwing bombs and finding his target. 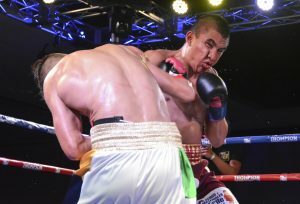 Unfortunately, a clash of heads caused the forehead of Esquivel to split open, and the ring doctor stopped the fight at 2:18. The cut did not look that bad, but Christian was saying that he couldn’t see. The match became a technical draw. 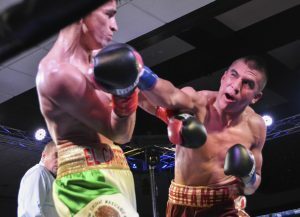 In the co-main event Mohamed Rodriguez (11-4, 4 KOs) matched wits with Cesar Villarraga (9-4-1, 4 KOs) in a bout between super lightweights. This fight was scheduled to go eight rounds. There is no doubt that Rodriguez has a lot of power, but missed with a lot of shots in the first round. It remained to be seen if he was just too amped up and wild or if Villarraga was able to dodge those punches. Both men landed in the second. Mohamed was still swinging for the rafters and sometimes striking out, but he did find his target at times as well. Cesar got in a couple of nice little combinations. Rodriguez was continuing to be a bit wild in the third, seeming to always be looking for that finishing punch. Villarraga had quieted down a little bit, trying to pick his spots. The two fighters tried to be a bit more measured in the fourth. Seconds before the bell, Cesar landed his best punch of the night, a beautiful overhand right that did not drop Mohamed, but certainly got his attention. Both men might have a headache later on, as they cracked heads really hard in the fifth and each took a few seconds to shake it off. Rodriguez landed the best punches in the round, but Cesar was showing no quit. They slammed heads again in the sixth, and again had to take a second or two. They were both landing bombs on the other during the round. In a round that might have been going Villarraga’s way, right at the bell he was staggered by a punch thrown by Rodriguez. The seventh was more of the same. This had been a very physical fight, and the men showed each other respect before the eighth by touching gloves and a quick hug. About a minute into the round, an attack by Cesar put Mohamed on the canvas. He got up and the fight continued, with both men giving their all. We went to the scorecards to find out the winner of this exciting fight. We had a split decision. On judge saw it 78-73 for Villarraga, while the other two had it 76-75 for Rodriguez. Unbeaten Saul Sanchez (6-0, 4 KOs) took on Nestor Ramos (7-7-1, 3 KOs) in a fight scheduled for four in the bantamweight division. This fight took longer to introduce than it did to fight it. Sanchez packs one heck of a punch, and he hit Ramos with a body shot that reverberated throughout the building. 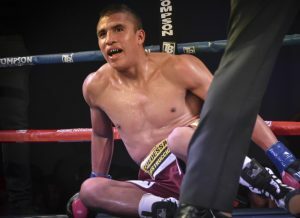 Nestor could not recover, and at 2:06 of the initial round the fight was over. 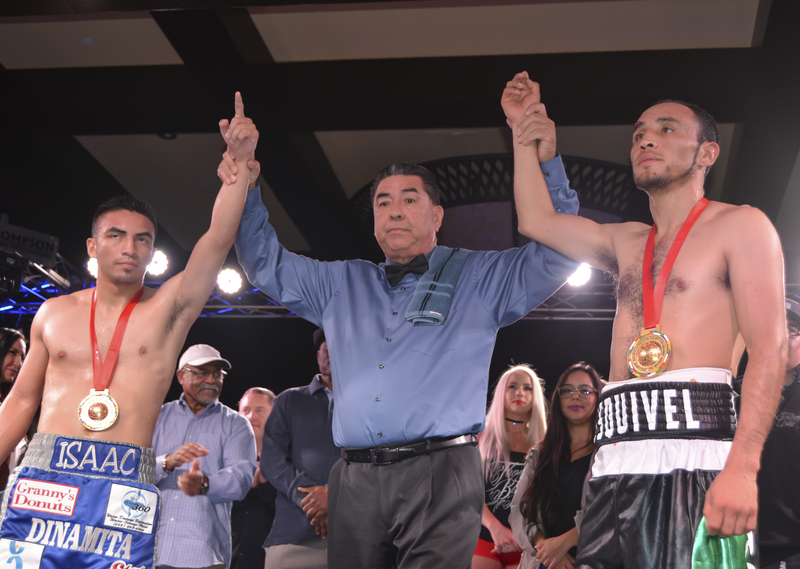 Super bantamweights came next, when the young Daniel Guzman (2-1, 1 KO) faced off against Jose Mora (1-5). This fight was for a scheduled four rounds. There were some good exchanges in the first, but the one who landed the more solid punches was Guzman. Guzman’s go to punches in the second round we brutal body shots, and eventually they took their toll. A hard left to the ribs of Mora put him on the canvas. He got up and continued, but Daniel attacked the same side again and Jose went down for the second time. The fight was waved off at 2:32 of that round by referee Zachary Young. To start off the evening we saw Brandon Trejo (3-0, 1 KO) face off against Carlos Apodaca (0-6-1). This fight was to go four rounds and was in the lightweight division. The first round was rather even until the last minute or so. At that point, Trejo was able to land a few very hard left hands on Apodaca. The second round was a rough one for Carlos. He was being battered from pillar to post. Brandon was landing body shots, punches to the head, and upper cuts. It was lucky for Apodaca that he got out of the round. 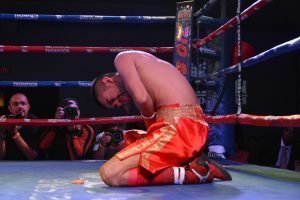 The punishment continued into the third, and finally referee Jerry Cantu had seen enough and waved the fight off at 1:21 of that third round. Carlos was quite dejected, but the stoppage was the smart thing to do. So, a rather short night in Ontario, with only one fight going the distance. Still, there was exciting action throughout the evening, and the fans on hand were enthusiastic and seemed to enjoy themselves.